What It Is: A bit of fragrance 101 for you here. Most fragrances you buy in stores have alcohol in them – basically a chemical stabilizer. When you use natural oils, you are getting a more powerful scent, and one you don’t have to worry about getting on your skin or in your lungs. 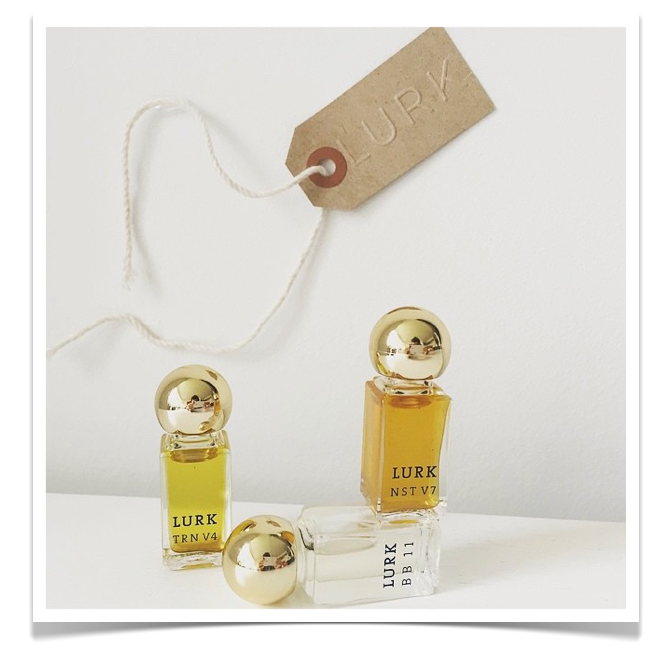 Enter LURK, a natural fragrance brand that produces luxury perfume oil blends. All of their products are certified organic (a hard designation to nab in the cosmetic sector), and include sustainably extracted ingredients to ensure their products aren’t just good for you, but for the planet. LURK has just released three new scents that are perfect for summertime wearing – and gifting! All of their fragrances are meant to be worn by men or women, and just a few little dabs can be enough to deliver a powerful bouquet of notes. BB11 is a distinctive, crisp scent layered with black balsam and ambrette seed. NST V7 is a fresh, sparkling perfume, based on pink lotus, tuberose, and citrus. And TRN V4 delivers a slightly more masculine musk, with tobacco and a trio of three florals. All three are great for tossing into your purse or bringing in your carry-on, wherever your travels may take you this summer. Who It’s For: Your jetsetting spouse, to smell amazing no matter what time zone they’re in. Your beauty-obsessed sister, to add to her perfume collection. Your organically-minded daughter, as a nice birthday gift she’ll truly love. What It Costs: Each fragrance is $55 USD. LURK does ship to Canada, but I also spotted them here. 1) First off! You must be a Canadian Gift Guide subscriber to enter this giveaway. Just find the ‘Gift of Gab’ box on the righthand side of this page and either hit ‘Follow’ or enter your email address. Once you’ve done that, leave a comment below telling me what LURK fragrance you’re most interested in trying.You have until August 10, 2015. 2) Entries are limited to one per person / per email address / per household (or more if you score bonus entries). A random draw will be conducted on or around August 11, 2015 to select the winner(s), who will have 48 hours to respond before another winner is chosen in their place. 4) Bonus Entry: Follow @lurkbeauty on Instagram and either Regram one of their photos or share a photo from their site on your Instagram. Leave a link back to your post in a separate comment below. I subscribe. Hard to tell a scent you would like online, but I did visit the site and read the descriptions. So I would choose NST V7 just by that. I’m already a subscriber. I’m most interested in trying RSW005: Eau de Toilette….the combination of sandlewood and rose sounds lovely. LOL, image the commercials they could come up with! I’d love to try RSW005! I’d be most interested in the RSW005 acent. Bs 0003 More choices than I thought there would be. I would love to try BB 11. It sounds very unique! I am a Canadian Gift Guide subscriber and I think the LURK BS 003 sounds like the scent for me. I would like the PRJV1 – Jasmine & Rose together sounds nice. I would like to try NST V7. Sounds lovely! NST V7 sounds great to me and I would love to try it. Just a thought -I think they should try to actually name their perfumes. It sound very clinical when it is number and letters. It would have more appeal that way. I’d like to try NST V7. Fresh for summer! I would like to try the RSW005 scent. I’m a subscriber already, I’m most interested in the NST V7. It’s difficult to choose a scent online but BS 003 sounds interesting to me. I want to try RSW005. I’d love to try BB 11 when it’s available! I think I would love the .BB 11. The Black Balsam caught my attention. I think I would like to try either BB11 or TRN-V4. http://lurkmade.com/rsw005-eau-de-toilette/ Love to try this one!!! RSW005 sounds perfect for me! I’m a subscriber and I’d love to try the BS 003: 1/8oz perfume oil. I’d like to try the NST V7. I would like to try NST V7 as I like a fresh smelling scent. I subscribe, BB11 sounds interesting!